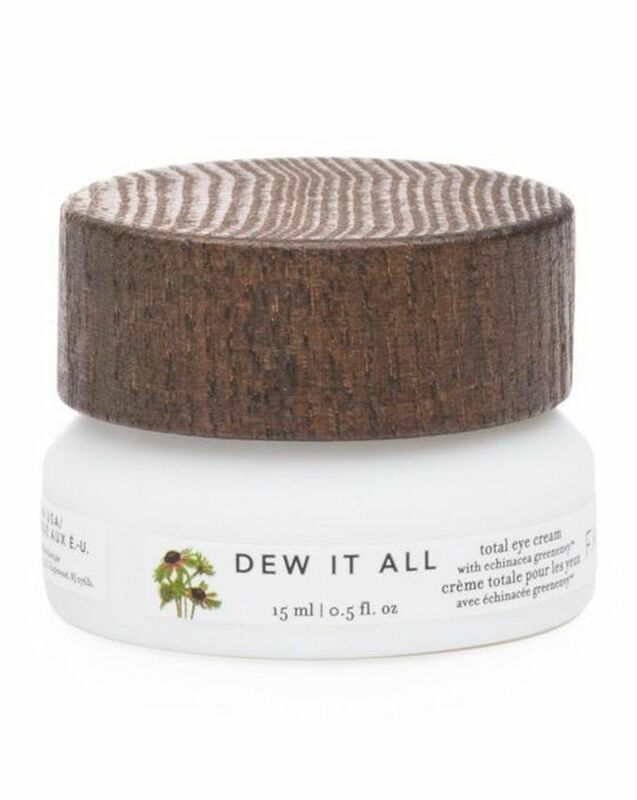 For parched, pigmented peepers – Dew It All eye cream works to firm and brighten them, reducing dark circles in the bargain. It contains FARMACY’s ‘secret weapon’ ingredient, Echinacea GreenEnvy, an antioxidant powerhouse that protects against ‘polluaging’ environmental aggressors. There are also a host of potent extracts and vitamins to calm redness and hydrate the delicate eye area. It will leave you looking bright-eyed - even if you’re feeling far from it. 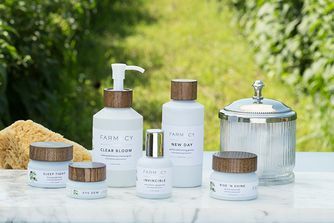 FARMACY are somewhat of a skin care phenomenon, pioneering the 'farm-to-face' philosophy, growing and cultivating ingredients themselves, which are then activated in their labs for maximum potency. 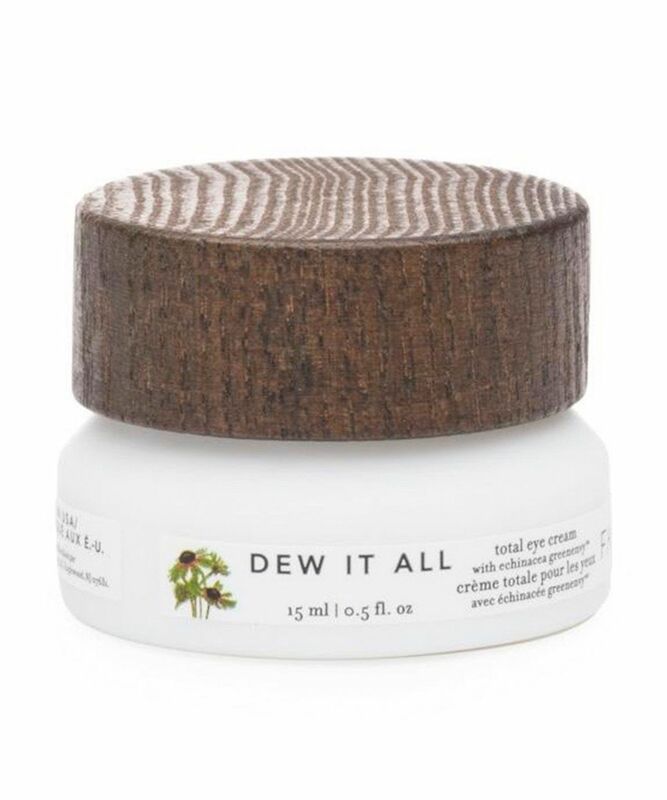 This firming and brightening Dew It All eye cream is no exception – it works to boost hydration levels with prickly pear extract, and rejuvenate with baobab fruit oil (naturally high in vitamins A, D, E and F). A special strelitzia nicolai seed aril extract helps to brighten and illuminate, while chamomile and calendula work to reduce redness, calm and soothe. Use this eye cream morning and evening. Tap a small amount above and around eyelids and under eyes. Can also be applied to the sides of the eyes, all the way towards the hairline. Smooth gently with inward sweeping motion to avoid stretching skin. Water, Glycerin, Coco-Caprylate/Caprate, Jojoba Estersm Copernicia Cerifera (Carnauba) Wax, Cetyl Alcohol, Caprylic/Capric Triglyceride, Patented Echinacea Purpurea 'Greenenvytm' Root Extract, Candelilla/ Jojoba/Rice Bran Polyglyceryl-3 Esters, Glyceryl Stearate, Undecane, Adansonia Digitata Seed (Baobab) Oil, Cetearyl Alcohol, Gluconolactone, Cetearyl Alcohol, Sodium Stearoyl Lactylate, Tridecane, Arachidyl Alcohol, Ribose, Butyrospermum Parkii (Shea) Butter, Xanthan Gum, Potassium Sorbate, Behenyl Alcohol, Strelitzia Nicolai Seed Aril Extract, Sodium Benzoate, Cetearyl Glucoside, Arachidyl Glucoside, Sodium Hydroxide, Allantoin, Gellan Gum, Hydrolyzed Hyaluronic Acid, Sodium Phytate, Cellulose Gum, Melia Azadirachta Leaf Extract, Chamomilla Recutita (Matricaria) Flower Extract, Calendula Officinalis Flower Extract, Melia Azadirachta Flower Extract, Benzyl Alcohol, Opuntia Ficus-Indica Extract, Amino-Esters-1, Calcium Gluconate, Amino Ester-1, Coccinia Indica Fruit Extract, Solanum Muricatum Fruit Extract, Rosa Canina Fruit Extract, Aloe Barbadensis Flower Extract, Algae Extract, Salicylicacid, Ocimumsanctumleafextract, Tocopherol, Curcuma Longa (Turmeric) Root Extract, Lawsonia Inermis Extract, Ocimum Basilicum (Basil) Extract, Pearl Powder (Margarita Powder), Sorbic Acid, Lactic Acid, Sodium Chloride, Sodium Glycolate. This product has slowly but surely become a staple in my skincare routine. I use targeted eye treatments with ingredients such as retinol 1 or 2 nights a week and this is brilliant for the other "in between" days. This cream feels soothing, gentle and nourishing on my delicate eye area and I think, teamed with other products through the week, I have seen a visible improvement in dark circles and fine lines. Overall I think this is a lovely eye cream, it feels hydrating and brightening. I have pretty dark circles and whilst I don't believe any cream can erase them, they do look less pronounced after a couple of weeks of using this cream. The only slight downside is that the cream does not get absorbed straightaway, at least for me. I think I would repurchase it, especially in the warmer months.